Book review: While We're on the Topic by Bill VanPatten. 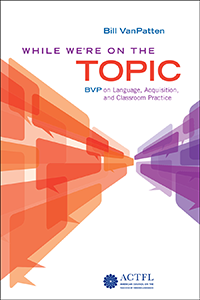 Bill VanPatten's book about language teaching is an admirably clear, simple and very short call to arms for classroom teaching based on input and purposeful tasks ("communicative input") and founded on research from the field of second language acquisition. If you haven't heard of him, VanPatten is a professor and teacher at Michigan State University self-professed diva of second language acquisition and a rare example of a reputed academic who engages with teachers, both through the written medium, conferences and his chatty radio show Tea with BVP. "This is not your conventional book, nor should you expect a high-falutin’ scholarly text with lots of citations, long sentences, and the like," he writes in his prologue. Take from that what you will. VanPatten begins with a definition of communication which he sees as the foundation of effective teaching, and this is not necessarily what you may understand about Communicative Language Teaching (CLT). He writes "Just because a person doesn’t teach “grammar the old-fashioned way” doesn’t necessarily mean that person has a communicative classroom or the class activities are communicative." Communication is the "expression, interpretation, and sometimes negotiation of meaning in a given context". It is also purposeful and complex, involving context, purpose, negotiation." "Language without purpose is not communication," he writes. You can see where this is going! Communicative classrooms involve the expression, interpretation, and negotiation of meaning with a purpose in the context of the classroom. He criticises "display questions" e.g. the typical question and answer sequences many teachers use (and which I often advocate!) "What colour is John's shirt? It's green." (Everyone can see the shirt is green. Does anyone care or see a point to this question?) This, in VanPatten's account is "practice", not commuinication. This is a familiar argument one response to which is that the classroom is a place of learning where artificial questioning has a role in building up skill through both meaningful and semi-meaningful repetition. VanPatten rejects this wholeheartedly. In his easy, conversational written style he devotes the rest of the very slim volume to developing the above points, including providing some examples of classroom activities and tasks (or Tasks) he would advocate. While he acknowledges that his Chomskyan view (Universal Grammar) is not universally held, in a later chapter he gives the impression that UG is a fact, a given in theoretical linguistics and "alive and well". UG, most associated with Chomsky, posits that learners come to the task of acquisition with built-in mechanisms for language processing and storage. This constrains how we acquire language and allows us to produce utterances which we have never heard. "Each of us creates a mental representation we call language. This is true for first, second, and subsequent languages. We create an abstract and complex linguistic system, though we are not aware of this." Thus, to be clear, VanPatten is definitely in the camp of those academics who believe second language learning is essentially the same as first and the role of teachers should resemble that of the caregiver - providing level-appropriate input and encouraging interaction with that input. Therefore classrooms need to be spaces in which learners receive lots of input and have many chances to interact with it. Simple! Too simple? "Let’s contrast the above with the following scenario. My French teacher tells me to repeat after him: “Je me trouve loin de chez moi.” I do as instructed, and I repeat. What that teacher says is not input, because I’m not focused on the meaning." This is a deliberately narrow definition of input. It may be comprehensible but it is not communicative. Is this definition too narrow? So what about traditional Presentation-Practice-Production? "Explicit rules (and paradigm lists) can’t become the abstract and complex system, because the two things are completely different." Is this true? While I accept that mental representation is not the same as pedagogical grammar I was not persuaded by the example he used about the water and fatty acid. I'm not sure we can know this for sure yet.What's more explicit knowledge of the pedagogical grammar can allow learners to monitor their accuracy (à la Krashen) and construct utterances slowly. So VanPatten writes: "Now, many would argue that, even though what’s on page 32 of the textbook doesn’t wind up in learners’ minds/brains, it is still useful, or maybe even necessary. Underlying this argument is that SLA is not like first language acquisition." Many do argue this, including some academic scholars but VanPatten's view is unequivocal, only meaning-focused input and interaction produce acquisition. VanPatten seems to prefer the term "communicative input" over "comprehensible input". In this sense he seems to value output, task-doing and communication more highly than does Krashen, for example. VanPatten argues, therefore, that language acquisition cannot be altered by explicit instruction and practice. This certainly runs counter to what most teachers believe.To support this he refers to research on the order of acquisition of morphemes. "Research on both first and second language acquisition has shown that grammatical morphemes (verb endings, noun endings, articles, and so on) are acquired in a relatively fixed order over time." Whatever a teacher does, the student will pick up the correct use of a structure or morpheme in their own time, in their own order. What's more, you cannot match the grammatical syllabus to a learner's order of acquisition since each student acquires at a different rate (not to mention that, by this argument, grammar cannot be explicitly taught anyway). He acknowledges, however, the limited research which suggests the first language can influence order of acquisition in the second. Although the book is not rich in classroom examples, there is a useful section on developing conversational interaction from beginner to higher levels, as well as examples of Tasks (with a capital T), task-like Activities and a lesson described in detail towards the end of the volume. These could be rough templates for many alternative lesson sequences. He has some relevant things to say about how teachers are not engaged with research and that when they do pick up on a new approach they attempt to meld the new with the old, "layering new ideas on top of an old foundation" i.e. adding elements of task-based learning to their existing grammatical/PPP syllabus. Some would see this as sensible principled eclecticism. VanPatten offers brief accounts of certain methodologies such as the Natural Approach (Terrel) and TPRS. The latter account is positive, but "What is not clear in TPRS is whether it has a communicative purpose: What is the outcome of a TPRS lesson other than to learn a language?" This is a fair criticism, if you accept VanPatten's assumptions about the nature of communication. TPRS, as I understand it, includes lots of input and communication of a sort, but not so much in VanPatten's sense. I find his views about authenticity of resources sensible. The task is more important than the content, he writes, and it's inappropriate to use authentic resources at the wrong level. I take that to mean that interest and task should trump authenticity. He also points out that teachers need to be proficient enough in the language themselves so that the provision of input and interaction is easy and effortless for them. This is frequently not the case, so it's a fair question to ask what such teachers should do if they cannot run communicative lessons. A word about VanPatten's Tasks; by his definition they requite two elements - expression and interpretation of meaning and a cognitive -informational element. The purpose of exercises is to practise language. Activities are partially communicative, e.g. a "what did you do last night?" with a partner. He explains the difference between input-orientated and output-orientated tasks, giving examples of how you can adapt a task to make it more challenging by requiring more pupil output. His "active/sedentary" example is a good ready-made intermediate level task. He makes the distinction between tasks and Project-based learning (PBL) which he finds inappropriate for novices. How might you build Tasks into your scheme of work? he suggests you could either drop them into your existing topics or let them drive the syllabus (hard to do in England and Wales GCSE context). In his final chapter about Focus on Form he gives examples of input enhancement, e.g. highlighting words, adding emphasis to words in speech or flooding input (by including lots of similar structures or patterns in the input). Here is a good example of a structured input task as he describes it. You could just see it as a useful listening activity to use. The following is a series of activities about what I may or may not have done last night after leaving the office. I will say them for you as you read along. Working with the person next to you, after we review them, indicate which ones you think I actually did. 1. I walked my dog. 3. I ordered Chinese food. 4. I watched Rachel Maddow. 5. I worked out at the gym. 6. I talked to my sister on the phone. 7. I paid bills. 8. I cleaned something. 9. I planned my day for tomorrow. 10. I plugged my phone in to charge. This activity has no right or wrong answers. As the students work through it, they operate on what they think is true. Only after they begin to share answers do students actually find out the truth. This is why we call this an affective activity: it utilizes students’ ideas, beliefs, opinions, and attitudes. "Flooding the input." But researchers and teachers still insist that we can make a difference in acquisition by focusing on grammar. Useful sample class at the end. Overall, from a teacher's point of view, I feel ambivalent about this book. On the one hand, it's led by research, passionate to the point of evangelism (always a concern for me) and challenges many pre-conceived views held by teachers, especially those with little knowledge of second language research. It provides a fresh look at CLT (where the C can stand for Contemporary as well as Communicative) and a lucid view of how languages are acquired along with some handy insights in how to create task-based lessons. There is no doubting where VanPatten stands and many teachers will be swayed by his recommendations. On the other hand, although he occasionally acknowledges that scholars are not united in their views, it presents a one-sided view of acquisition in its dismissal of skill acquisition, alternatives to Universal Grammar, the critical period hypothesis (which claims that older learners do not possess the same faculties for language acquisition as children up to a certain age) and PPP as a valid way to present and practise language. Furthermore, the definition of communication seems unnecessarily restrictive to me - plenty of comprehension activities we do certainly further acquisition despite not being communicative by VanPatten's definition. The book is also pretty short of practical classroom activities, focusing as it does on the wider view. Fundamentally I am wary of any book which seems to be saying it's all quite simple and that "this is the best way". I don't think we can know this yet. Research is only a few decades old; students, teachers and syllabuses vary. To be anecdotal (as one of those teachers both receptive and somewhat resistant to some of his claims! ), I was able over many years to teach students from the age of 11 to 18. Many of these students became quite fluent and sophisticated speakers based on a mixed diet of PPP, drilling, comprehensible input and some task-based learning, including games. For many students this mixed diet seems to work. I also felt that my students were not immune to the order in which I taught grammar, despite the evidence of research so far. If you flood the input with structures students are far more likely to start using them themselves spontaneously In some ways what they achieved was remarkable compared with what a six year old can do after thousands of hours of input from caregivers and friends. I wonder whether VanPatten's recommended approach might be a better fit with more advanced students rather than beginners. While We're on the Topic is available as a print or e-book from the ACTFL (American Council for the Teaching of Foreign Languages) store for the modest price of around $13. BVP was at Michigan State University, not the University of Michigan. Thank you Sherry. Now corrected.